When you Digiprove a document, file, or any other digital content you create irrefutable evidence that it exists in exactly that form at that point in time, and that you are in possession of it. This is critical for companies and professionals who are regulated, as it allows them to prove the audit trail of documents generated by compliance procedures. Select the file(s) with the content you wish to Digiprove. This can even be a zip file with lots of content, for instance a company can Digiprove the entire body of daily reports, or the entire record of emails for that day. The "digital fingerprint" of the content will be calculated automatically. This can be used later to uniquely identify the content. Files do not need to be uploaded to our servers so confidentiality is assured. You will receive by email a Digiprove certificate that you are in possession of the content with this fingerprint. That's all there is to it. 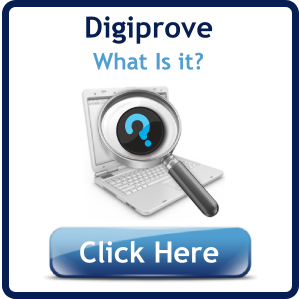 You can use Digiprove's verification facility to prove irrefutably in future the creation date and exact content of this digital data. 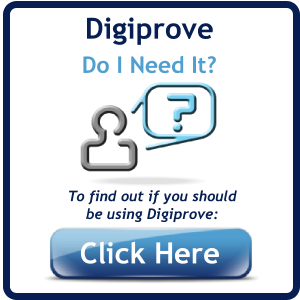 It is easy to integrate Digiprove into existing applications. The integration can be done by your own people or we can help. Either way, the integration means that Digiproving is happening in the background automatically. Digiprove can be configured to prove the integrity of nominated folders and files on a regular basis, or can be built into backup procedures so that an entire database is Digiproved on a daily basis. There is also desktop integration, whereby you can cause files to be Digiproved by right-clicking or dragging. If you use WordPress for content management or your website, there is a plugin available called "Copyright Proof" which automatically Digiproves all new or amended content. A Digiprove certificate is written in plain English, but you will also receive a digitally-signed file containing the certificate as an attachment to the email. The digital signature is important because it proves that the certificate has come from us and is included in our secure, provable audit trail. We also keep a copy of the digitally-signed certificate in case you	lose it. More about Digiprove certificates. We offer a choice of payment plans and deployment methods depending on the needs of your company. Smaller companies and departments can immediately start to use the Digiprove online service by choosing the subscription plan that suits their requirements. There is also a subscription-free "Basic" account which can be used to aid evaluation. The service can also be deployed in-house with intranet/vpn web access and can also be integrated into existing applications and systems. Contact us at +353 1 4404312 or sales@digiprove.com to learn more about this option.